Running a nice little family restaurant in New York isn’t what it used to be, what with spiking rent prices, competition with hipster eateries and ever-changing food tastes. 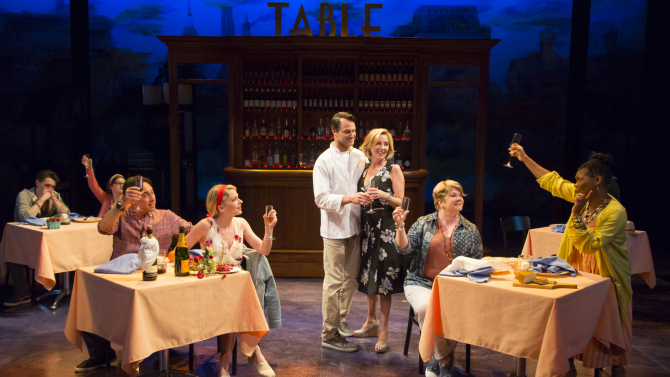 These and more are the issues facing the owners of Table, the homey establishment at the heart of the Long Wharf Theater’s world premiere of “The Most Beautiful Room in New York,” a pleasant but overstuffed, not-yet-satisfying musical by New Yorker writer Adam Gopnik and Broadwaymusical vet David Shire. There’s certainly plenty to chew on here — including an abundance of food-as-life metaphors — but sometimes less of a full plate is advisable for a show with a straightforward, family-first theme. The idea of trying to find a middle ground in a rapidly changing world of tech, commerce and ever-shifting identities remains relevant and relatable, but first you need compelling characters to care about. Here there’s the generically nice family of chef David (Matt Bogart, a late-in-rehearsal replacement), his wife and front-of-house-manager Claire (Anastasia Barzee), their teenage son Bix (Tyler Jones) and young daughter Phoebe (Sawyer Niehaus). Things are enlivened when David, in desperate financial straits because of a soaring rent increase, asks help from former business partner Sergio (Constantine Maroulis, delicious as he is devilish). Sergio now heads a food empire and could use the street cred of David’s respected position in the Union Square market community. Complicating matters: Sergio (“I may be a bad boy, but I’m not a bad guy”) had a long-ago fling with Claire. Their connection gets reheated when he returns to turn the Table in more ways than one. Providing contrasting food/life philosophy is Carlo (Mark Nelson in endearing comic-sage mode), who runs Anarchist Pizza in Bensonhurst, where David grew up.